Over the past year, the enterprise network grew significantly more complicated, creating new challenges for network professionals, according to IDG’s 8th annual State of the Network study. Internet of Things (IoT) projects, the demands of an increasingly mobile workforce, and an explosion of apps prompted network professionals to enhance their network infrastructure and the skillsets needed to support it. Network professionals are now being asked to help shape IT strategy, requiring a strategic and business-oriented mindset; as a result, they are communicating with the CIO and line of business colleagues more often than in the past. To drive innovation, 82% of respondents are collaborating with IT colleagues. As the network continues to evolve, organizations are researching technologies and strategies to ensure their systems remain effective. New technologies continue to be introduced at a rapid frequency forcing network professionals to adjust to more complex workflows. Software-Defined Networking (SDN) is the top network/data center initiative that organizations are focused on, with 40% of respondents actively researching the technology. Organizations are shifting to SDN to meet business demands as SDN enables the network to interface with applications directly, improving speed and efficiency. Additional technologies that are on the radar for consideration include: network function virtualization (38%); data management/analytics (36%); application performance (35%); and SD-WAN (34%). The average IT budget for organizations is $137 million, which is a 10% YOY increase. 93% of respondents said their IT budget would increase or remain the same in 2018, while only 7% expect their budget to decrease (compared to 12% in 2017). Organizations of all sizes are committed to IT investments as budgets will increase by 10% for enterprise organizations (more than 1,000 employees) and 15% for small-medium sized businesses (SMBs, less than 1,000 employees). Organizations acknowledge the importance of the network as they continue to increase their funding towards network-related technologies. The top areas receiving additional budget remain the same from 2017: network security (61%), application development (61%), and cloud services (60%). With the adoption of cloud computing and the challenge to constantly remain ahead of cyberattacks, it makes sense that budgets are remaining strong for these important technologies. There are several important drivers fueling network investments. Improving data security, ensuring availability (uptime), and enhancing network speed/performance top the list as 53% of respondents agreed these are the primary benefits behind network investments. Other key drivers include ensuring business continuity (51%), improving the customer experience (45%), reducing expenses (44%), and enhancing IT process efficiency (43%). Network security poses a serious challenge for IT professionals, making it the number one priority for enterprises. Security and data availability prove to be particularly challenging; 69% of network professionals find it difficult to balance availability vs. a secure network. In fact, the top two challenges facing network professionals are security-related: maintaining network security while assuring connectivity (42%) and protecting against data breaches/leaks (36%). Given the importance placed on security, it is no surprise that 82% of respondents agree the networking team is spending more time on security initiatives than in the past. Organizations are keeping security top-of-mind when allocating budget for the year. IT professionals expect budget increases for security tools in the following areas: compliance (46%), disaster recovery (42%), and IT governance (37%). Network executives are also researching, or have on their radar, specific initiatives related to network security including: data loss prevention (36%); corporate data encryption (33%); ID management solutions (32%); enterprise mobility management (31%); and mobile management (31%). IoT continues to see an increase in adoption, with 22% having IoT plans underway, compared with 19% in 2017, and 46% expecting to have plans underway within three years, compared with 40% in 2017. The benefits of IoT use are evident; 27% of organizations currently use the tools to support decision-making through data; 26% see better optimization of assets; and 25% are automating maintenance work. To support IoT initiatives, organizations are increasing investments in IoT connectivity (30%), connectivity management (27%), and IoT Security (27%). IoT’s far-ranging impact can be seen in the advancement of edge computing. Edge is moving the processing of information closer to where it is being collected/generated, and in the process is changing networking. Most notably, edge computing reduces latency and allows data to be analyzed at the edge of the network before being sent to a data center. The majority (56%) of organizations already have plans for edge computing. Organizations are paying close attention to converged infrastructure and mapping out implementation plans. 69% of organizations have plans to implement converged systems while 63% have plans to implement hyper-converged systems over the next year. Although this is an emerging data center technology, almost half (47%) of organizations have it on their radar, are actively researching, or are piloting hyperconverged infrastructure. 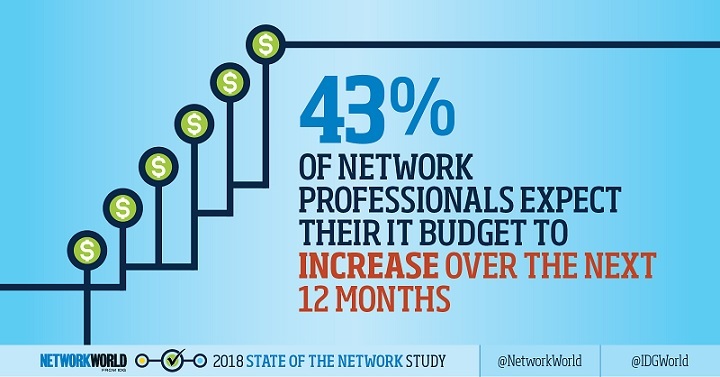 About State of the Network: Network World’s 2018 State of the Network study is conducted annually to pinpoint where IT executives and professionals are with initiatives within existing and emerging technologies that impact the network. The 2018 Network World State of the Network study was conducted among the audiences of six IDG Communications’ brands (CIO, Computerworld, CSO, InfoWorld, ITworld and Network World) representing IT and security decision-makers across multiple industries. This was a targeted research effort — to be qualified respondents must have indicated that they are on the team primarily responsible for networking at their organization. Using this criteria, results are based on 268 respondents. For the purposes of this report, enterprise organizations refer to those respondents at companies with 1,000 or more employees. SMBs refer to those respondents at organizations with less than 1,000 employees. Percentages on single-select questions may not sum to 100% due to rounding.